BANGI, 8 August, 2010 – With the Excellent Thesis award in her hands for her Ph.D from the Education Faculty UKM, Rodiah Idris is determined to mould High Performance Schools (HPS) students holistically to enable them to compete in the international arena. Rodiah who is now the Senior Assistant Director in Residential and Excellent Schools Management Division of the Ministry of Education (MOE) is determined to strengthen the soft skills of the HPS’s students. She believes that apart from academic excellence, soft skills are crucial in efforts to achieve the highest peak of one’s life. A mother of three, she received her Bachelor Degree in 1989 and only decided to pursue her post graduate studies for her Master’s Degree in 2002 and going for her Ph.D in 2008 in Measurement and Evaluation. She was grateful for the assistance extended by her academic supervisors, Prof Datin Dr Siti Rahayah Ariffin and Assoc. 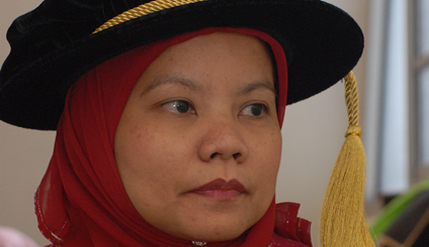 Prof Dr Noriah Mohd Ishak, when pursuing for her Ph.D. Her thesis is entitled: ‘Examining the Psychometric properties and establishing generic skills benchmarks’. Her thesis is mainly about choosing the most reliable, just and quality item in MaGSI. Hence it will create a reliable benchmark of generic skills for UKM graduate students. Development of MaGSI is based on MQF which is in line with cognitive and behaviourism theories. Her research findings show that UKM students’ generic skills are high especially in communication, social responsibility, critical thinking and problem solving. She was very enthusiastic in undertakaing her research as she believes the outcome would help to improve an institution to be more innovative, progressive and creative. She found female students’ generic skills to be better than the male students from both the science and the non-science streams. She believes that with firm generic skills, students will achieve whatever they desire in life. She also believes that UKM will continuously accomplish excellent results especially on research.